Is there space for neutrality? "Which political side do you belong to?" Some give up voting | Free speech: a shock? The way we approach GE13 is no less important than the election outcome. As activists chant their clamour, the last thing we need from the cream of the society is to dive in for a sing-along. Jom turun padang, they say. Many who consider themselves the cream of the society have placed themselves in advisory roles, telling others how to vote. They feel knowing more, having more, and therefore fit to recommend with exclusive authority. They feel superior, the golangan terpelajar dan bijak pandai. What we need from the cream of the society is to put issues in context, tell us what lessons we can learn from the past, in Malaysia and outside. Point out the similarities, contrasts, and how we can chart our course. Suggest to us the best bet. Show us the grayscales, instead of frantically splashing buckets of black and white paint over multi-coloured originals. Get us out of simplistic black-and-white portraits, help us think, in realistic true colours. Before claiming to be neutral, let us aim to be objective. Neither The Economist nor Le Monde is neutral; they are not meant to be. Neither would ever make a fool of themselves reporting A-punch-B events while zipping their lips and cameras whenever B punches A. Let us consider the recurring themes: corruption, democracy, bi-partisan system. Corruption is nothing new, neither is phantom voting. We do not need extra mouse clicks in spreading those audiovisuals. What we need are brains and hearts that put us in perspective. Back in the 1860's, Massimo d'Azeglio said at the unification of Italy, "We have made Italy; now we have to make Italians!" What sort of Malaysians would we like to form? Instead of joining the partisan, self-absorbing sing-along, we need original, constructive ideas. How best can we channel the money recovered from corruption to close gaps in the society and to beat crime? Is the money going to people who have swimming pools at home, those aspiring to have one, or those hidden out of sight, in the slums? What sort of democracy do we want? A referendum-based one, one ending up legalising euthanasia? One where minorities will always lose? One which allows frequent strikes and demonstrations, or one which is sensitive to the people's preference well before they ever get the chance to take it to the streets? And if bi-partisan configurations are typically associated with gridlock, failure, crisis, stalemate, how can we do better (if that is really what we want at all)? When the crying need is to zoom out to see the bigger picture, the cream of the society engages in zooming people into a cul-de-sac? As if Malaysia is alone in the universe, having no history and no neighbours to learn from? The last thing we need is to replace racial divide by partisan divide (didn't we say we wanted to abolish divides), or to tip the weighing scale by flooding emerging channels with the reverse bias (didn't we ask for neutral channels). And, before attempting to influence our neighbour's vote, let us acknowledge that our neighbours have a pair of eyes, a pair of ears, a head and a cardiovascular system too. Since the taboo is finally broken, let us talk about it. Will there be another May 13th? It depends how we look at it. In a way, no it will never happen again, because whatever happens will be the invention of the current generation rather than an echo of the past. Viewed another way, it is already taking place now in a bloodless, chronic form -- just look at the present sentiments, the growing opposition-vs-ruling cult. Are Malaysians floating around Indah Water tanks? My mom's first driving license was a kopi (coffee) one. Kopi license means the examinee hands the examiner the cost equivalent to a cup of coffee; she then gets exempted from having to enter a car for her driving test. It was more prevalent than today's cancer; today we say everyone knows at least a family member, relative or friend who suffers from cancer. Kopi license was more prevalent than that. So was kopi saman (summon) -- traffic offenders either offered a kopi treat or paid the fine. Today, my friend in Eastern Europe passes the doctor a cash-filled envelop before the doctor would lift a finger to save her dying dad. It all takes place in an open ward. Also today, governments sitting on oil beds send students abroad. Badge after badge, students share the habit of knocking at their professor's door every week for signed letters -- to certify that they are eligible for extra pockets of money from their sponsor due to reasons U, V, X, Y, Z. Corruption runs in the blood, everyone does it, they justify. In Wales we used to (half-)joke that you'd find people in pubs not just Thursdays or Fridays but anytime of any day because everyone lived on benefits (kebajikan funds); no one needed to work. Ok, half-jokes aside, you get the hint. Our colleague who had a decent full-time job was on not one but multiple packets of benefits; his fellow countrywoman was on the verge of reporting him. 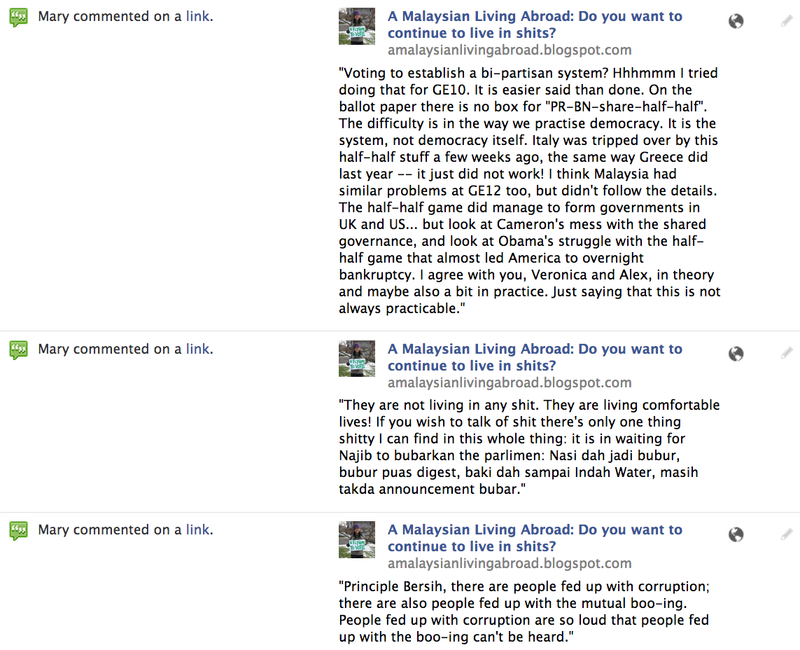 So why so many Malaysians react as though they have never seen corruption before? Kebersihan / cleanliness, kesihatan / health / jiankangjiaoyu was a compulsory subject in the Primary One curriculum I studied at Yuk Choy, Ipoh. It was always tightly paired with civics / gongmin, taught by the headmaster himself. I remember raising my hand asking him whether I was Chinese or Malaysian. By the way, I grew up discovering, many years later, that the worst corruption has nothing to do with money. Last elections, when I asked to vote by post, the answer was 'no way!' The bar is now lifted; that's great news. I am most grateful to the pejuang-pejuang (fighters) for making this happen. Early this year, renewing my passport in Ipoh was a breeze. I was treated like a pelanggan (customer); government servants finally shed that colonial-era sense of superiority. Compared with last time: kiasu queues zigzagged multiple floors hours before the office opened. Another delightful progress. The political awakening in Malaysia is remarkable. Extra media channels opened up, propagating the sort of reports Malaysians hadn't seen before. Also, people no longer vote in the shadow of May 13th. Another two leaps forward. As my friends in some other countries brace for expected uprising, one already has financial and immigrational arrangements in place so that he can fly his family out before air traffic shuts. In Malaysia I only heard of stocking up canned food (which is nothing new for Malaysian elections; not everyone who said it did it though). In this aspect Malaysia shines: we are optimistic about changing without going through an Arab-like spring, we can bypass an Arab-like spring. Creative entrepreneurship such as that of Oldtown White Coffee adds to the many things we can rejoice in. Whether this and the preceding five paragraphs are pro-ruling-party, or not, depends on the maturity of the reader. 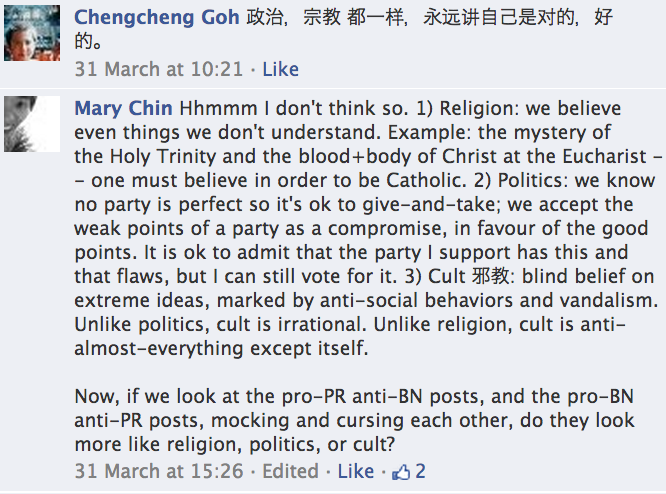 DurianFM asks: which political side do you belong to? In saying, "If you don't support PR that's means you are BN's dog," DurianFM neatly coined the political climate in Malaysia. This is strikingly similar to the current LGBT movement in the West, where, if one does not openly pledge support, he is doomed to be branded as ignorant, under-educated and discriminative. 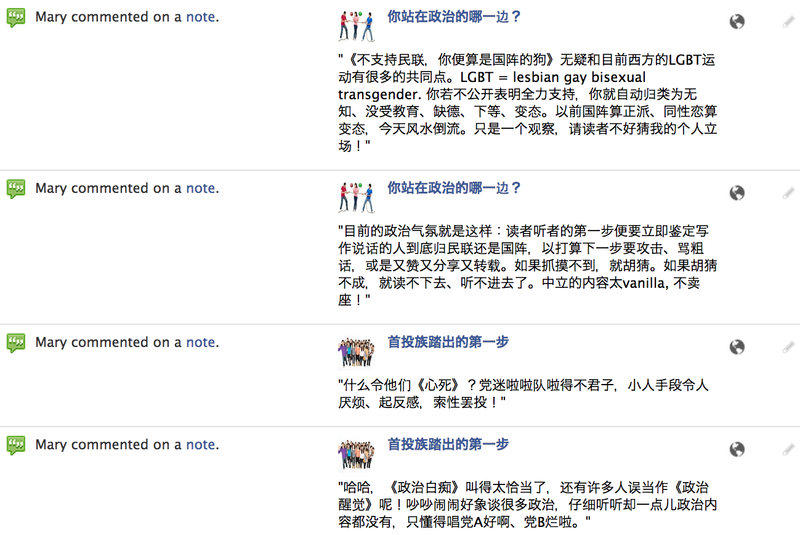 Previously, BN was the mainstream, homosexuality wasn't. Today, we see a reversal of fengshui. Just an observation. Note that I didn't make a stand, so please do not guess. The current political climate is as follows: the reader's first step is to identify the author as either pro-PR or pro-BN, so as to frame the next step whether to attack with mockery or to like and share and forward. If the reader fails to grasp the author's political inclination, he resorts to guessing. If he still fails to grasp anything tangible, he gives up reading. Contents of neutral political stand is too vanilla to be popular! DurianFM asks: How do we encourage first-time voters to make their debut? What makes them give up voting? Party fans cheer and boo in undignified ways and dirty tactics, so people develop a resentment, we get the counter-effect of people refusing to step out to vote. DurianFM got it right by coining, 'political idiots', exactly! But then many mistake that as 'political awareness'. Lots of heaty debate as if lots of political ideas are being exchanged, but if we listen carefully we would find zero political contents. They only know how to either shout boo or praise as angels. We speak of second-hand smoking and bystander effects (where neighbouring cells not directly exposed to radiation mutate). So what about the third parties in the present opposition-vs-ruling stand-off? Among the third parties are foreigners consuming information we let out in the media. Taking away mocks, curses and attacks each side fires against the other, there is hardly anything left. No depth, no meat, no substance. Foreigners watch from the outside the fish tank how Malaysians lose balance, defy their education and make a fool of themselves. Even more delicate are fellow Malaysians belonging to neither pole -- those caught in the cross-fire. Many decide to give up voting. They will not go to the polls. They are fed-up and demoralised. They cannot afford any optimism in this you-play-dirty-we-also-play-dirty game. All right, to some extent this pattern of drawing sensation from enmity, and drawing fuel from mocking, may be acceptable as part of the local culture. To some extent it may be forgiven as a transitional phase, hopefully short-lived and harmless. That's what keeps them going. But only to some extent. Such acts are basically unhealthy, self-centred, and inconsiderate. Such acts potentially cause long-term damage. Dividing the nation this way benefits no one. 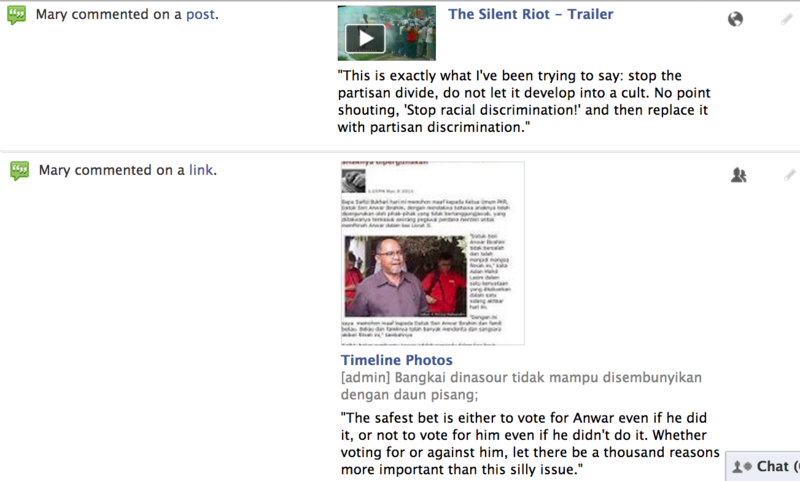 Yet these are the people who claim to reform Malaysia by eradicating existing racist division. Replacing one form of division with a new variant only creates further wounds and scars needing to be healed over time. It would be good to exercise some restrain, unless one is absolutely sure that the division will disappear after the elections. Have Facebook etc been a bad experiment? That is for Malaysians to prove. Liking and sharing without thinking, without considering the ripple effects, are no good signs. While clicking those icons out of impulse is itself harmless, spreading biased contents may cause long-ranging aftermath. After all, once shared and spread, it will not be as easy to unshare and unspread. At some point when I was a kid the Chinese press association raised the issue of civilised news handling: accidents and deaths must not be splashed as jingcai (splendid) headlines. Today, it seems that we are back to square one: men and women on the street celebrate with jubilation reports of corruption and irregularities. They break into a frenzy spreading those reports like wild fire. But then these are the people who claim to be against corruption, why then is corruption celebrated as hot news? It is simply that triumph in finding the weakness of another. Does such spirals empower us or sink us? Imagine one day Malaysia grows out of corrupt ways, would people be able to cope with that void -- that absence of sensation? Information is for informing, not for exaggerating or over-replicating. The other side of the coin asks: since many Malaysians do not know how to deal with information, perhaps we do need ISA after all? When a report says a top government official murdered someone and the official denies it, do people automatically believe that the murder actually took place? Well, these believers obviously haven't learned the lesson from the Ecuadorian daily's coverage of President Rafael Correa. Thank you DurianFM! I hope DurianFM will also give us some tips: what's the difference between supporting a political party and supporting a football team? What is the difference between opposing a political party and taking an ancentral revenge? On the chess board how do we draw the middle line? When does cheering becomes keterlaluan (over-the-top), infringing others' freedom to vote? Under what circumstances would we offend the rules of the game? In the excitement of competition, we seem to have forgotten the meaning of elections. As voters of course we must choose and support one. We cannot say we are impartial to all parties, otherwise elections are not going to work! So, everyone makes a choice. Other countries go through elections too; Malaysia is not the only one. What are the differences? 1) Others express their choice at the ballot box and it is a personal decision, whereas many Malaysians impose it on anybody they can get hold of 365-24-7 anywhere and everywhere; 2) others wait to find out the outcome from the polls, whereas many Malaysians try to manipulate and pre-determine the outcome of the polls to their own favour; 3) others respect the sovereignty of their neighbour's vote, whereas many Malaysians rate others as stupid, daft, uneducated, cheated, thugs, evil. The problem is these supporters are not registered with any political party. More often than not, they have no clue about politics, democracy, ideology, revolution and reformation. What is the difference between supporters and militants? Supporters express their decision at the ballot box; militants attack and incite hatred. Supporters vote as gentlemen and ladies; militants ambush and attack. Supporters decide for themselves as to whom to vote for; militants decide for the country. What we ae seeing is a looting of voting rights: men and women on the street take advantage of a lack of general order, and decide to steal from each other. If one really cares for the country, one would sit down, consider the local context and formulate lessons we can learn from the many reformations here and elsewhere, now and throughout history. Without equipping oneself with the relevant knowledge -- chewed, digested and contemplated upon -- a process which takes time and patience and dedication and sacrifice -- he is not fit to try teach others how to vote. becoming a people who rely on maids, need to be cleaned after, and believe in being served rather than serving others. And then we send our kids overseas to professors who clean their own homes, change nappy and cook for their families. Media were biased, so we stand up against the monopoly. And then, opportunists started new channels under the 'neutral' hood. Under the hood is the opposite bias. We were divided by ethnic groups, so we call for oneness. And then, opportunists replaced it with a new form division -- ruling versus opposition -- and turn the division into a cult. Elections were unfair, so we rise up against dirty powers. And then, opportunists loot each other of free-will voting. Jom Pantau is a wonderful idea, roping in the rakyat to help ensure clean elections. So we sign up as volunteers... only to be compounded by, "Come join us so that Barisan can't cheat!" Pantau was supposed to be neutral. Pantau protects us from the government; who protects us from fellow voters? Jom Balik Undi (let us go back and vote) is a great initiative, calling out for anak-anak (children) Malaysia scattered abroad. But then instantly it became dubbed as, "Jom Balik Undi to ousted Barisan!" Can't we leave Jom Balik Undi as Jom Balik Undi, full-stop? The equation is simple: if I entered Malaysia and the Ruling Party offers me citizenship and voting rights, I would say thank you I accept and I vote according to my free will. If I am a Malaysian residing abroad and the Opposition Party fights for my right to vote by post, I say thank you I accept, all the same I vote according to my own judgement under no pressure whatsoever. But what sort of democracy do we want? Myself for one I want democracy which has a definite place for leadership, where rakyat do not try to puppet leaders, and rakyat do not get into the habit of critisising the government left, right and centre. I want a government with spine and backbone. Take one of the portfolios for example: Kementerian Sains, Teknologi dan Inovasi -- if someone can't differentiate between Sains, Teknologi and Inovasi, why tell the government how to run? We need leaders who inspire and dare to be controversial, who give us a vision and lead us there. I would also avoid the sort of democracy many countries are suffering today, where the elected worry about nothing except getting re-elected; the live examples are begging us not to dive into the same trap. Further questions for Malaysians: what sort of democracy do we want? A referendum-based one, one ending up legalising euthanasia? One where minorities will always lose? One which allows frequent strikes and demonstrations, or one which is sensitive to the people's preference well before they ever get the chance to take it to the streets? Let us now switch to the psychoanalyst's language and search our past, our childhood. If we count the skeletons in the closet, we shall find that we do not have that many after all. Malaysia's baggage is relatively light. We have neither the Hiroshima nor the Auschwitz patch; we were neither the aggressor nor the victim. Yes, earlier generation(s) did suffer the Japanese occupation, but that was brief and nothing of Rwanda's magnitude. Yes, we were colonised, but the British was not the worst coloniser. Indeed, there was bloodshed during May 13th, followed by a prejudiced quota system in the years to come, but that was far from apartheid of any shape and form. Those who call it apartheid can go somewhere like the Richmond Slave Market, sit there and meditate for a few hours, come back and tell us what slavery and apartheid mean. If we recollect our own personal experiences of being forgiven, we would find no motivation whatsoever to hold that grudge. The racist quota system was a solution to restore peace and to kick the country out of the May 13th state of emergency. Now, that fix has proven to be quick and dirty. We decide to change. So let us do it now. It is not too late. If we recount the many blessings we ourselves received, really, that episode where somebody else received extra goodies will not matter anymore. Our calculators can go down the drain. If it is all about somebody else getting what they did not deserve, can't we spare a moment of openness to reconsider the logic of life. After all we all got goodies we were never quite worthy of -- be it from our parents, family, friends, or the unnamed. The sun did shine upon us and the rain did shower upon us. Gifts did drop down from the sky for us. Can we for a moment let go of that sense of undeservedness? CORRUPTION was part of growing pain, now is indeed time to shake it off. We are not alone; the Economist's correspondent who visited 23 African countries for a recent coverage was never approached for a bribe (rather inconceivable last time). INFORMATION is for us to handle and relay with integrity and responsibility. Let information not develop into distraction. ZOOM OUT in time (historically) and in space (geographically) to learn from mistakes here and elsewhere, now and last time. AVOID AT ALL COSTS any possibility of dividing the nation, specifically with the present opposition-versus-ruling movement; let it not develop into a cult. Encourage fellow Malaysians to come out and vote, by restoring optimism in the society; reduce enmity and cross-fire; do not play dirty with dirty. Ensure a conclusive and fair outcome, so that everyone will accept as the people's choice, and respect as a collective decision. Make sure people have no one to blame, so that we can all roll up our sleeves and start solving problems. X accuses Y of winning by cheating and Y accuses X of winning by cheating. -- are we ready for Satu Malaysia? Exclude the above groups? We are going to end up with an empty pool of zero head-count. It is going to be Kosong Malaysia rather than Satu Malaysia.